I’ve wanted to do this ever since my mask book first came out, but the process takes a really long time and I always seem to have other things to do. And — I hate to admit it, but I sort of put it off because I didn’t own a Kindle myself, and I couldn’t quite see the point. Now I have one, and I love the darned thing. A few weeks ago I used my Scrivener program to reformat the Kindle version of Make Animal Sculptures with Paper Mache, and this week I worked on the mask book. Even with Scrivener, it still takes a long time, but I think it’s worth it. I’ll try to get the doll book and the tiny dog book on Kindle in the next month or two. That’s all for today. Stay warm and have fun! I’m in Brazil, I currently participated in a workshop where volunteer teachers from a public school taught us some basic mache masking techniques. I do not have Kindle. I really wanted the book but I do not have the money. I can not buy in the amazon because I do not have a credit card and even if I had due the exchange rates and import would be a fortune. Hi Mackenzie. I know that Amazon.com doesn’t have distribution centers in Brazil, and that does make it difficult to purchase US books, other than the Kindle version. You might be able to order the book through your local bookstore, or ask your library if they can get an inter-library loan. Jonni I just purchased your How to Make Masks book on Kindle. Thanks so much for taking the time to do this! I have enjoyed all of your wonderful tutorials and creative ideas. Last year I needed to create a trophy for a talent show and was able to do it quickly using techniques from your site. I’ve attached a photo that needs a bit of explanation. We live in a compound overseas called Las Dunas and when we asked the local engraver to make a label we should have written the example on a grid clearly showing the spacing. 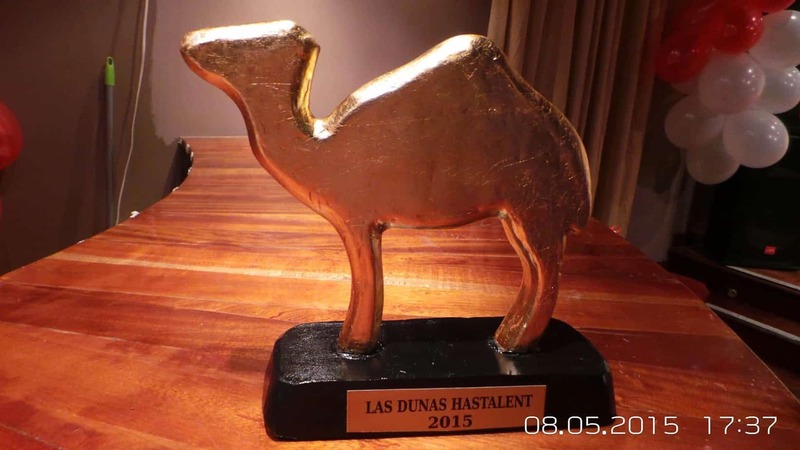 Since english is not his native language instead of Las Dunas Has Talent it arrived saying Las Dunas Hastalent. We all thought it so appropriate since we run into creative spelling of english every day so it will be very nostalgic for the recipient. I do have a question about your kindle book. Has anyone else found that the photos for the chapter Iron Celtic Helmet did not all appear? I have a Kindle Paperwhite, Kindle app for MacBook Pro, and Kindle app on my iPad and they all have the same photos missing. One photo does appear … the one preceding the text “As you can see I left my helmet quite rough”. I have contacted Amazon and followed all of their suggestions. The representative was supposed to send me an email with her research documented to let me know if the pictures were missing on her devices but all she said was that there was not enough information to come to a conclusion. I will explore the issue with Amazon further but I thought that perhaps others may have mentioned the same problem which might give Amazon more clues to follow. I will probably just order the hard copy when I return to the US since I like to have a book to scan … too old fashioned I guess. Hi Terry. Just yesterday I was informed by Amazon that those images disappeared from the kindle version of the book. Who knows why? I corrected the problem and sent the new version to the Kindle store. I’m not entirely sure how it works, but I think you can get the corrected version by asking Amazon.com to download the book again to your device. I’ll do some checking online to see how that works. And now I have to go Google Las Dunas – I’ve never heard of it before. Living there must be quite interesting! Terry, I just now sent an email to amazon asking them to notify everyone who purchased the book, and tell them the corrected version is now available. I hope their email will explain how to download the new version for free. Maybe they’ll send me a copy, too, so I’ll know what they’re telling people. It could take several days before that happens, of course. Thanks for letting amazon know about this problem, by the way. That’s probably the reason why they contacted me. I would never have known, otherwise. Great! I will investigate that. Las Dunas Garden Village is in Khobar or Khubar, Saudi Arabia. You may or may not find much information on it. My husband works for a joint venture startup company owned by American and Saudi companies. I have lots of free time for art and teaching art classes but finding the materials is challenging. Yes, there was an email awaiting me from Amazon announcing an update to the book. I downloaded it and all photos are now visible. And yes, I did see that the contents are missing from the navigation bar but it did not bother me since the actual page of contents has hot links. 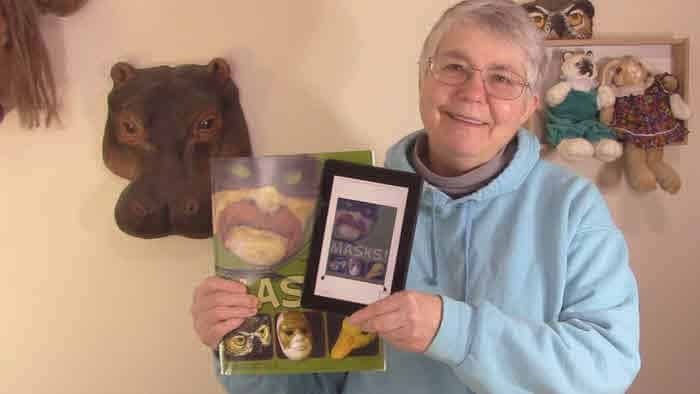 Hi – I have just ordered your book on AmazonSmile and I am going to make animal masks with 30 4th grade students – trying your method. I have always used clay as a base. I am wondering if I can continue with clay (not use Super Sculpey) and still work with your fast-setting paper mach mixture. Yes, you can use any kind of clay you have on hand. If you use wet clay, instead of oil-based clay, you’ll want to put some light plastic wrap between the clay and the paper mache, so the water won’t soak up into the paper and keep it from drying. Be sure to do a few tests ahead of time, before the class. You might want to use the joint compound/glue gesso as paste, instead of the plaster-based paste I used in the book, because of the plaster paste will harden in the bowl, and the joint compound paste won’t. Yes, we use wet clay and that makes sense about covering it before paper mache. I would like to try your joint compound/glue gesso as paste (I have used joint compound before) but I’m having trouble finding a nontoxic joint compound. Can you recommend one? I’m not a chemist, but it’s my understanding that the toxic aspect of joint compound is the silica dust that can collect in your lungs when you sand. In a classroom setting, sanding would be a real mess, anyway, so I don’t recommend it. Different school systems have different standards, though, so it’s best to check with whoever is in charge of determining which products can be used. There are some companies that make “low VOC” joint compound. Murca is the brand usually named, and some large stores carry it. Their website states that they meet ASTM C475, but that’s just the standard specifications for joint compound. The MSDS for the Sheetrock brand joint compound, which is available almost everywhere, states that the VOC content is zero. No matter what brand you use, never sand it without using a mask. Silica is nice on a sandy beach, but not in your lungs. I must say, you are such an inspiration to me! Your work is impressive and amazing! The best place to start is with Kevin Doheny’s guest posts, here and here. And browse through the tutorials on how to make a mask on this site. And do start a long time before the production. This is a huge undertaking, and I applaud you for courageously taking it on. That’s wonderful Jonni. Congratulations! If I’ve ever seen someone who has stick to itness, you got it woman. I remember, at least I think I do, that you once said publishing your books in Kindle format would not allow for your pictures. Looking at your book on Amazon, it appears it is possible. Was that due to your Scrivener program? I do know Scrivner will allow pictures, but am wondering if it may be a problem elsewhere in the process. Hi Sharon. Some Kindles don’t have color, but I did figure out, several years ago, how to get pictures onto a kindle book. They now have illustrated children’s books, in fact, so I just wasn’t quite up to speed when I said that it wasn’t possible. When I put the Make Animal Sculptures on Kindle the first time, I had to hand-code the HTML, which took forever. This time, the Scrivener program did help a lot, although it still took about a week to take all the nice formatting out of my print versions and put them into the format needed so you could easily read the books on a Kindle. Fun idea. I’m sure with the number of creative people found here on your blog there would be those who would jump right in. I was involved in a build a story on Goodreads a few years ago. The way that one worked was someone began the story, wrote a few pages, then the next person picked up where the story left off, then wrote a few pages more. The story went a little crazy and most who opted in, opted right out. So, it never went anywhere. It was fun the very short while it lasted. Can[t wait to see your pictures you have in mind for it. I’d opt in to your idea.